Hanoi (VNS/VNA) - The domestic sugar industry should restructure all stages of its production process towards diversifying products to improve competitiveness, according to the Ministry of Agriculture and Rural Development (MARD). At a meeting between leaders of the MARD and the Vietnam Sugarcane and Sugar Association (VSSA) in Hanoi this week, Minister of Agriculture and Rural Development Nguyen Xuan Cuong said that to improve the competitiveness of the sugar industry, "production cost must be reduced at all stages." “Besides that, the association and businesses need to pay special attention to mechanisation, irrigation, organic farming, cooperation models in production, new cooperative models and diversification of products made from sugarcane products,” Cuong said. 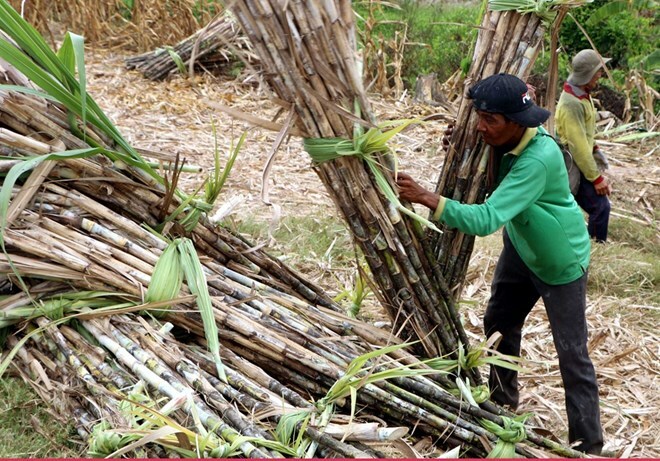 The ministry will accompany the association and enterprises to promote the production of sugarcane varieties to meet demand on the varieties of farmers, thereby raising Vietnam's sugarcane productivity to 90-100 tonnes from 50-60 tonnes at present, he said. The MARD, the Ministry of Science and Technology and the VSSA are likely to cooperate in developing quality standards and regulations for the sugar industry. VSSA Chairman Pham Quoc Doanh said the sugar industry, especially sugar mills, are facing difficulties due to the lowest price of sugar in the past 20 years. Climate change and tariffs under the ASEAN Trade in Goods Agreement (ATIGA) effective from January 1, 2020 also create pressures on the industry, he said. Therefore, the VSSA has proposed to the Government and ministries a series of solutions to overcome the existing difficulties, Doanh said. In addition, solutions need to pay attention to restructuring variety production, aiming at supplying all sugarcane varieties with high quality and productivity for farmers after 2020. The VSSA has proposed the Government permit only the import of raw sugar for refineries and have mechanism of granting import licences for monitoring the volume. Meanwhile, the Ministry of Finance was asked to propose to the National Assembly adjustment and supplementation of special consumption tax at 12 per cent on imported High-Fructose Corn Syrup (HFCS), or liquid sugar extracted from corn, damaging the domestic sugar industry. Vietnam has 36 sugar factories with a total capacity of 150,000 tonnes of sugarcane per day, an increase of 12.7 times compared to 1995. The total sugarcane area in the country is about 300,000 ha, an increase of about 10 times compared to 1995. Every year, the industry produced about on average 1.5 million tonnes of sugar, earning about 300 trillion VND, meeting the domestic demand and stabilising price on the domestic market. All 36 sugar-processing factories have entered the production season this year and until March 15, they have produced 750,000 tonnes of sugar. Meanwhile, sugar price is still low of 10,500 VND per kilo of white refined sugar due to big inventory from the last crop.